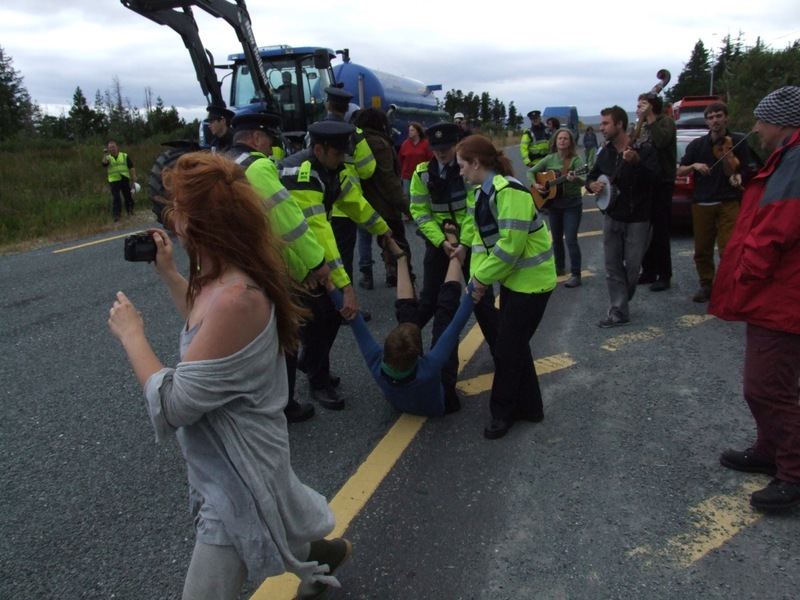 Local residents and folks from the Rossport Solidarity Camp met at the gates of Shell’s Ballinaboy refinery to begin blocking tractor movements. Everything coming out of the refinery in the morning was delayed by the protesters and no arrests were made. By 8:30am two people had locked themselves into a concrete barrel blocking the road. 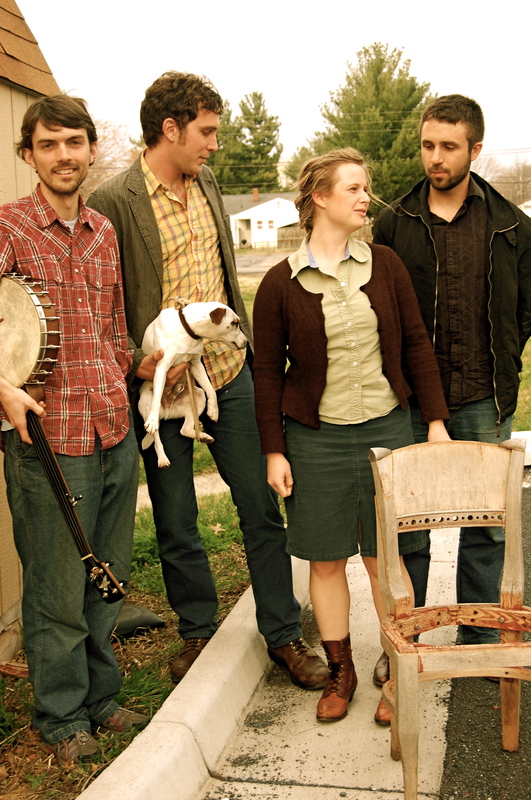 Later on people gathered at the refinery to listen to some bluegrass country music by the band Belle Star all the way from Virginia, US. The band had played a fantastic gig in McGuire’s pub the night before and commented that the refinery gig was one of their ‘strangest but most appropriate’ yet. People were in high spirits, dancing to the music in front of a Shell truck. The police found it difficult to use their normal force against smiling dancing people. The hilarity made people feel pretty unstoppable. Even when guards were pushing people along the road with the Shell truck inching along, the bluegrass band kept up with everyone, walking along the road as they played, upright bass and all! 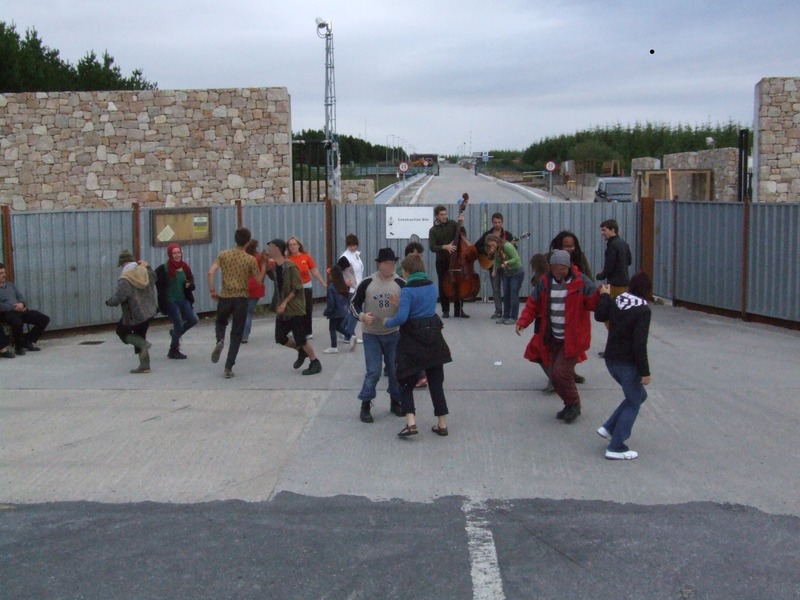 The day finished off with a traditional Appalachian square dance in front of the gates of the refinery. Everyone felt like it was a wonderful way to reclaim that space that is usually occupied by much more sinister activities. There you go! Congrats to the awesome Belle Star from Virginia, USA for supporting community action struggling to defend their land against massive international giants. And if you’re wondering, the first line of this blog could be recognised from Doc Watson’s ‘The Train Carried My Girl From Town’. Stay connected to The Lurkers to hear where we are playing next – a Coal Seam Gas protest next week in Sydney!